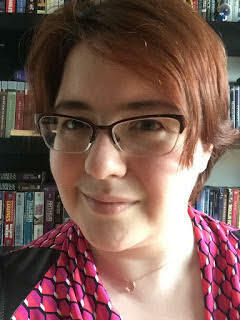 Many thanks and high fives to this month's lovely Secret Agent, Moe Ferrara of Bookends Literary Agency! Becoming a literary agent was fitting for the girl who, as a small child, begged her dad to buy her a book simply because "it has a hard cover." Growing up, she had a hard time finding YA books outside of Christopher Pike and R. L. Stine, and instead tackled Tom Clancy or her mom's romance novels. Though her career path zigzagged a bit—she attended college as a music major, earned a JD from Pace Law School, then worked various jobs throughout the publishing industry—Moe was thrilled to join the BookEnds team in May of 2015 as a literary agent and the subsidiary rights director. A Pennsylvania native, she is the proud owner of one rambunctious guinea pig who is a master at stealing extra treats. When not reading, she is an avid gamer and always awaiting the next Assassin's Creed release. I’m still on the look out for a great adventure Middle Grade — something with humor and a lot of heart. I’d also love to find a great retelling of some ilk. Greek and Roman mythology is my soft spot, though!